Dr. Ph. 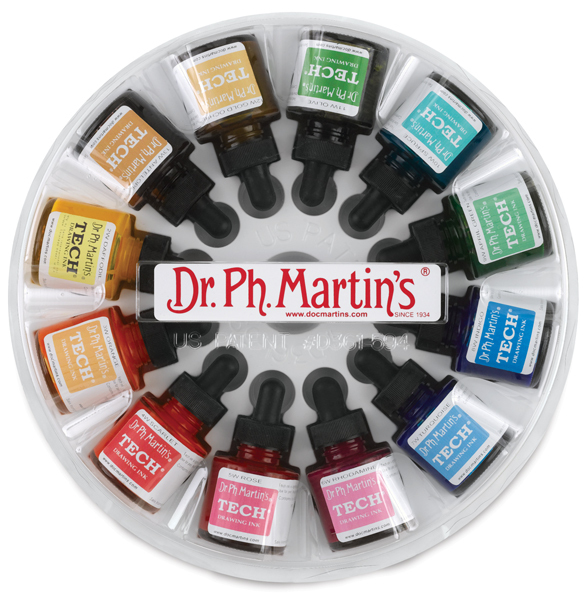 Martin's Tech Drawing Ink contains fine artist’s pigments to ensure transparent, lightfast, archival results. Use it with technical pens, calligraphy pens, and drawing pens. It also works well with brushes and airbrushes. 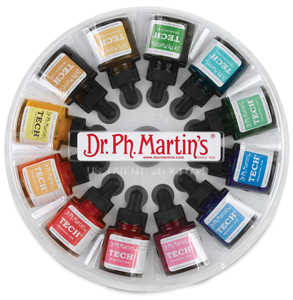 This set includes 12, 1 oz (30 ml) bottles, one each of the following colors: 2W Daffodil, 3W Orange, 4W Scarlet, 5W Rose, 6W Rhodamine, 7W Turquoise, 8W Indigo, 9W April Green, 10W Spruce Green, 11W Olive Green, 12W Gold Ochre, and 13W Antelope.